Trim fat from meat. Coat an extra-large nonstick skillet with cooking spray; heat skillet over medium-high heat. Cook meat in hot skillet until brown on all sides. Transfer meat to a 3 1/2- or 4-quart slow cooker. In a small bowl whisk together soy sauce, vinegar, brown sugar, oil, ginger, garlic, and pepper. Pour over meat. Transfer meat to a cutting board, reserving cooking liquid. Cut meat into 1/2-inch slices. To serve, drizzle meat with cooking liquid. If desired, sprinkle with green onions and sesame seeds. 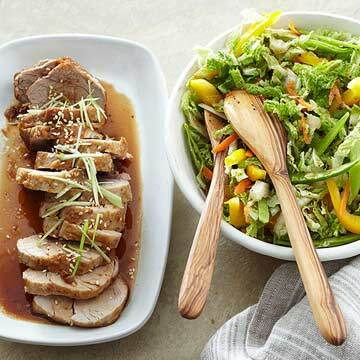 Serve with Asian Slaw. In a medium bowl combine cabbage, sweet pepper, carrot, pea pods, and green onions. For dressing, in a screw-top jar combine vinegar, canola oil, sesame oil, soy sauce, salt, and black pepper. Cover and shake well. Drizzle dressing over cabbage mixture; toss to coat.